Need a Spot of Sun? Here are 5 of Taiwan's Most Fantastic Beaches! With almost 1,600 kilometres of coastline, you would expect Taiwan to have some decent beaches, and it does. In fact, Taiwan’s beaches are plentiful, and its seas powerful. I have never seen waves so adamant and awe-inspiring as the ones that crashed up on the shores of Hualien after a typhoon. But by the time we drove south to Kenting, the storm had passed and the beaches seemed to have settled down into sunny, friendly places with all kinds of water activities underway. The concentration of beaches in Kenting in the tropical south and its surrounding areas makes it an ideal place for swimming, snorkelling, surfing and scuba diving. A little ways northwest in Kenting National Park is Hengchun Township, where you can wade into the water and snorkel right off the beach—no boat trip necessary. Just a few feet beneath the surface is an electric ecosystem of tropical fish, many of which are totally bizarre looking and completely foreign to Western eyes. Meanwhile, if you head east in Kenting, there are good waves for surfing off the coast of Jialeshui. Hengchun itself is dotted with white sandy crescent beaches, if you’re after a good spot to swim. If you’re looking to scuba dive, you’ll find several dive shops and operators on the main strip who will take or teach you. 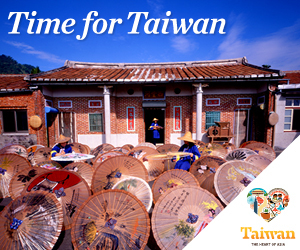 Taiwan is an island encased by warm Pacific Ocean shoreline everywhere! There are scenic spots and great swimming scattered throughout the entire country, with the temperate north boasting some mesmerizing black sand. The seaside town of Wai’ao is an extremely popular surfing area for amateurs and seasoned veterans alike, and offers lessons and surfboard rentals. A little further south, Nanao Township is a great place to hike surrounded by gorgeous coastal scenery and dark, mystical shores. When you’ve flown across the world to get somewhere, few things feel as good as that first leap in the ocean. When we arrived in Hengchun, we had half an hour to freshen up at our hotel before our van picked us up to take us into the national park. I decided I needed to run down the main strip to the beach and deposit myself directly into the Pacific immediately. The water was warm and the waves tossed me around gently as I floated around on my back, watching the clusters of people at the beach bars, standing around and chatting and handing each other bottles of Taiwan’s Gold Medal beer. I closed my eyes and felt the strongest sun on my face. 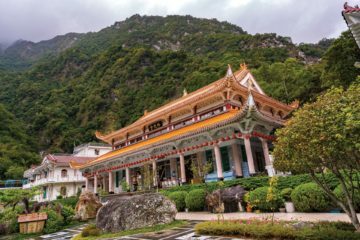 READ MORE of Team Outpost’s Adventure Taiwan! It’s easy to lose track of time this way, and when I finally emerged from the water, everyone was sitting in the car waiting for me. With no time to shower or change, I climbed into the backseat dripping wet, salt quickly caking all over me as the driver blasted the air conditioning to an absurd level to compensate for the 40-degree heat outside. I leaned back in my seat as our van took off into the waiting forest, thoroughly uncomfortable, but happy and alive. Sophie Kohn is a writer from Toronto who works at the Canadian Broadcasting Corporation and was part of Team Outpost Taiwan.